Siri, how can I save money on my next car? Remember Siri Eyes Free? First announced back in June 2012 as Siri’s next frontier, the functionality allows car makers to install kit in their vehicles that allows iPhone owners to perform a whole host of tasks using Apple’s intelligent assistant — like taking calls, calling up directions or creating reminders — without ever taking their hands off the wheels. Siri Eyes Free sounds great, but we’re still waiting on cars to actually ship that support the feature. 2013 looks like it’s the year that it’s going to happen, though. 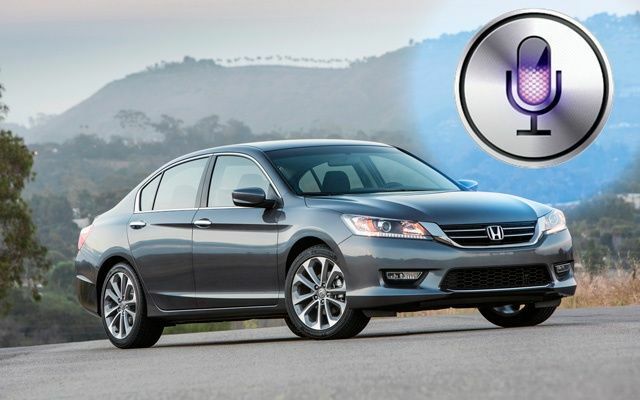 Following Hyundai and Chevy’s announcement that Siri Eyes Free was coming to their car now comes word that Honda will be offering the functionality in the new Accord and Acura. According to Honda’s announcement, Apple’s hands-free extension of Siri will be available as a dealer-installed option on the new Accord, along with the RDX and ILX from Acura. There aren’t a lot of details outside of that, and there’s no word on pricing for the kit. Here’s the full press release. TORRANCE, Calif., Jan. 30, 2013 – American Honda today announced it will integrate support for Siri, the intelligent assistant that helps you get things done just by asking, into its 2013 Honda Accord and Acura RDX and ILX models as a dealer installed option. Later this year, owners with a compatible iPhone* running iOS 6 can direct Siri to perform a number of specific tasks while they safely keep their eyes on the road and their hands on the wheel. Using Eyes Free mode, Siri takes hands-free functionality even further and minimizes distractions even more by keeping your iOS device’s screen from lighting up. Honda recognizes the power of Siri and Eyes Free mode as an in-vehicle tool that will help meet the connectivity and convenience needs of its customers in a responsible manner. Honda has reengineered its software to seamlessly integrate Siri Eyes Free mode into its Bluetooth® HandsFreeLink® via the onboard microphone and speakers.